What should be a team's reward for a monster season? How about a chance to stand in front of the Green Monster? The West Hartford Youth Baseball 10U Bulldogs capped a dream season on Monday, Sept. 4 when they were honored at Fenway Park for their run to the Cal Ripken 10U World Series. After taking the New England Regional title in July, the Bulldogs headed to Hammond, Ind., just outside of Chicago. After a day of travel where they were greeted at O'Hare International Airport, the Bulldogs spent their second day at the 10U ice breaker event where they met the other nine teams in the tourney. Later that day, they participated in the opening ceremonies. After two days of travel and ceremony, the Bulldogs got to take the field. They started their pool play with a 1-0 win over Mid Atlantic in a pitcher’s duel. The big hit for the Bulldogs was a walk off game winning hit by Dom Trolio. Mason Hebert and Jonah Balcerzak pitched a combined shutout. After winning the squeaker, the Bulldogs had a day off and attended the Banquet of Champions – teams, community volunteers and families had dinner together with Babe Ruth and Cal Ripken execs from all over the country. Hal Morris (a World Series Champ with the '90 Cincinnati Reds and a lifetime .304 hitter) was guest speaker. The Bulldogs received customized Regional Championship/World Series Wooden Bat and signed baseball cards by Morris. The Bulldogs' next game was a 180 from their previous game as they lost Game 2 of pool play vs. Midwest Plains, 9-8. MP took advantage of four Bulldog errors to plate seven unearned runs and jump out to a 8-3 lead. With 2 outs and nobody on in the sixth, the Bulldogs down to last batter, Jaden Kass singled and ignited a rally that saw the Bulldogs score five runs to tie the game. Four doubles in the inning by Benny White, Chase Hanawalt (2 RBIs), Mason Hebert and Josh Shemanskis (3 RBIs) helped the cause. MP won the game in the bottom of the inning on a single, walk and error. Now 1-1 in pool play, the Bulldogs won another close game vs. the representatives from the South, 5-4. It was another walk-off win, this time thanks to a single by Pat O’Shaugnessy in the bottom of the sxith, scoring Cooper Tantraporn, who led off with a triple. Josh Shemanskis (2RBIs), Tantraporn, Dom Trolio each had two hits. Later that same night, Tyler Redden placed third in HR Derby in the Skills Competition and the Bulldogs won the “Around the Horn” Competition – Jonah Balcerzak, Chase Hanawalt, Tyler Redden and Mason Hebert. After one week in Hammond, the Bulldogs finally got a chance to face the tourney hosts. Hammond greeted the Bulldogs with solid pitching as they defeated WH, 5-1. The Bulldogs couldn’t get the bats going to help strong pitching by Jonah Balcezak and Zach Goslee. Chase Hanawalt, Josh Shemanskis and Cooper Tantraporn (RBI) had the three hits for the Bulldogs. Despite the loss, the Bulldogs advanced as one of the six teams to qualify for the Championship Bracket. The Championship Bracket proved to be tough as the Bulldogs were shutout, 5-0, against Southeast. The bats stayed quiet as Bulldogs were only able to scatter 5 singles off of SE’s ace pitcher. The next day, the Bulldogs shook off the disappointment of their initial loss, with their third walk-off win, this time over Mid Atlantic, 6-5. This time it was Chase Hanawalt (3 RBIs) that singled in Jaden Kass for the winning run. Kass once again started a two out rally with a single to right. Matt Oriola pitched 3-plus strong innings allowing only 1 earned run. Elijah Wells was on base twice with a single and a walk. Tyler Redden hit 2 HRs and had 3 RBIs. After 10 days in Hammond, the Bulldogs played their final game, a 12-5 loss to the team from Crown Point, Ind., which scored six runs in the first inning and never looked back. Josh Shemanskis had 2 RBIs. Later that night, the Bulldogs watched the team that eliminated them (Southeast team from Raleigh, N.C.) win the World Series, edging out Pacific Southwest (Pearl City, Hawaii), 5-3. The next day, the Bulldogs headed back to West Hartford, but not before stopping on Chicago's South Side to see the White Sox play the Royals. 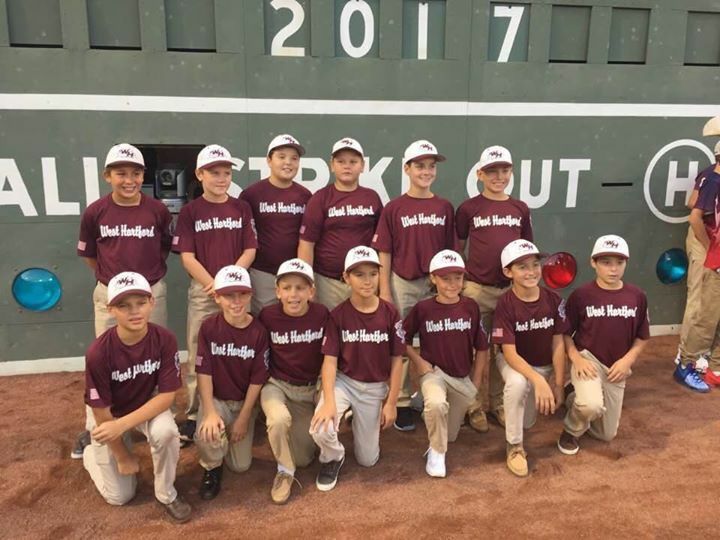 From Districts to the World Series and the chance to see two different color Sox in their home parks -- and to be honored at Fenway -- it was a season to remember for the WHYBL 10U Bulldogs. Overall Reocrd 29-7. Swept Districts, States and had one loss in Regionals.